We tend to think of the ancient tribal practice of sacrificing animals and even people on stone alters as a primitive and nonsensical religious rite. Yet the Christian Bible speaks of a God that demands constant blood sacrifices for the atonement of sin. The Old Testament is filled with stories about people building stone altars and then sacrificing the finest male sheep from the herd to be slaughtered before the Lord. It always struck me that the reverse culling of the herds must have created a less viable breed of sheep since this practice continued for hundreds if not thousands of years. Hebrews 9:22 states: "Indeed, under the law almost everything is purified with blood, and without the shedding of blood there is no forgiveness of sins." The murder of Abel by his brother, Cain was the result of a disagreement over offerings the brothers made before the Lord. Abel raised sheep and offered the firstborn of his flock as a blood sacrifice, while Cain was a gardener and could only place his produce on the altar. God had "regard for Abel and his offering, but for Cain and his offering he had no regard." 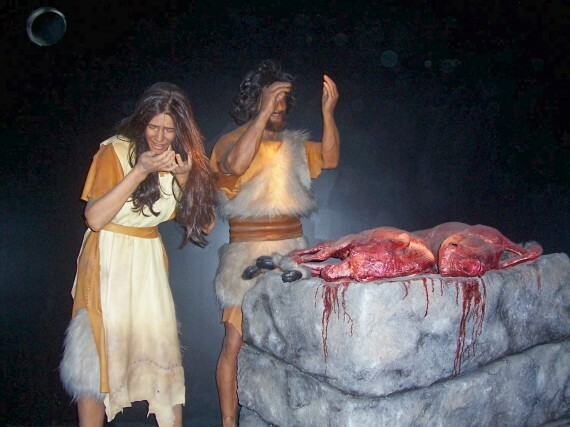 Even Noah, who reportedly brought two of every type of animal and beast of the earth on the ark to escape the flood, had to squeeze in a few extra creatures so that after the danger was over, he "took some of every clean animal and some of every clean bird and offered burnt offerings on the altar." God was so pleased with Noah for making such an offering he made a covenant to never do anything as crazy as flooding the earth and killing all living things again. Of course all of those blood sacrifices in the Old Testament pointed toward the great sacrifice of the man, Jesus, which is described in great detail in the Four Gospels of the New Testament. Jesus then "gave himself as a ransom for all." (1 Timothy 2:6). Now, instead of slaughtering a sheep on a stone altar in the back yard every time we sin, all we have to do is commit ourselves to Jesus. This self-proclaimed commitment is allegedly supposed to purify us of all sin. Once we have accepted Jesus, it appears that we are free to run around sinning freely, without worry about having to kill something to atone for it. This is modern religion. Nothing primitive about it.